A couple of years back, while I was on my World’s Fair kick, I wrote a post or two (or three) about how we imagine the future, or, rather, how we fail to imagine the future. 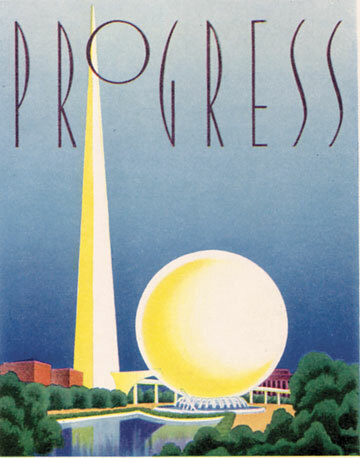 The World’s Fairs, particularly those held between the 1930’s and 70’s, offered a rather grand and ambitious vision for what the future would hold. Granted, much of what made up that vision never quite materialized, and much of it now seems a tad hokey. Additionally, much of it amounted to a huge corporate ad campaign. Nevertheless, the imagined future was impressive in its scope, it was utopian. The three posts linked above each suggested that, relative to the World’s Fairs of the mid-20th century, we seem to have a rather impoverished imagination when it comes to the future. Thiel is not the only one who thinks that we’ve been beset by a certain gloomy malaise when it comes to imagining the future. Last week, in the pages of the New York Times Magazine, Jayson Greene wondered, with thinly veiled exasperation, why contemporary science-fiction is so “glum” about AI? The article is a bit muddled at points–perhaps because the author, noting the assistance of his machines, believes it is not even half his–but it registers what seems to be an increasingly recurring complaint. Just last month, for instance, I noted a similar article in Wired that urged authors to stop writing dystopian science-fiction. Behind each of these pieces there lies an implicit question: Where has our ability to imagine a hopeful, positive vision for the future gone? Kelly got 23 responses, and then he constructed his own 100-word vision for the future. It is instructive to read the submissions. By “instructive,” I mean intriguing, entertaining, disconcerting, and disturbing by turns. In fact, when I first read through them I thought I’d dedicate a post to analyzing these little techno-utopian vignettes. Suffice it to say, a few people, at least, are still nurturing an expansive vision for the future. But are their stories the exceptions that prove the rule? To put it another way, is the dominant cultural zeitgeist dystopian or utopian with regards to the future? Of course, as C.S. Lewis once put, “What you see and what you hear depends a great deal on where you are standing. It also depends on what sort of person you are.” Whatever the case may be, there certainly seem to be a lot of people who think the zeitgeist is dystopian or, at best, depressingly unimaginative. I’m not sure they are altogether wrong about this, even if the whole story is more complicated. So why might this be? To be clear before proceeding down this line of inquiry, I’m not so much concerned with whether we ought to be optimistic or pessimistic about the future. (The answer in any case is neither.) I’m not, in other words, approaching this topic from a normative perspective. Rather, I want to poke and prod the zeitgeist a little bit to see if we can’t figure out what is going on. So, in that spirit, here are few loosely organized thoughts. First off, our culture is, in large measure, driven by consumerism. This, of course, is little more than a cliché, but it is no less true because of it. Consumerism is finally about the individual. Individual aspirations, by their very nature, tend to be narrow and short-sighted. It is as is if the potential creative force of our collective imagination is splintered into the millions of individual wills it is made to serve. Looking at the problem of consumerism from another vantage point, consider Nicholas Carr’s theory about the hierarchy of innovation. Carr’s point of departure included Peter Thiel’s complaint about the stagnation of technological innovation cited above. In response, Carr suggested that innovation proceeds along a path more or less parallel to Maslow’s famous hierarchy of human needs. We begin by seeking to satisfy very basic needs, those related to our survival. As those basic needs are met, we are able to think about more complex needs for social interaction, personal esteem, and self-actualization. In Carr’s stimulating repurposing of Maslow’s hierarchy, technological innovation proceeds from technologies of survival to technologies of self-fulfillment. Carr doesn’t think that these levels of innovation are neatly realized in some clean, linear fashion. But he does think that at present the incentives, “monetary and reputational,” are, in a darkly eloquent phrasing, “bending the arc of innovation … toward decadence.” Away, that is, from grand, highly visible, transformative technologies. Bogost adds, “When one is enervated by future ennui, there’s no vigor left even to ask if this future is one we even want.” The technological sublime, then, becomes the consumer sublime, which becomes future ennui. This is how technological innovation ends, not with a bang but a sigh. The second point I want to make about the pessimistic zeitgeist centers on our Enlightenment inheritance. The Enlightenment bequeathed to us, among other things, two articles of faith. The first of these was the notion of inevitable moral progress, and the second was the notion of inevitable techno-scientific progress. Together they yielded what we tend to refer to simply as the Enlightenment’s notion of Progress. Together these articles of faith cultivate hope and incite action. Unfortunately, the two were sundered by the accumulation of tragedy and despair we call the twentieth century. Techno-scientific progress was a rosy notion so long as we imagined that moral progress advanced hand in hand with it. Techno-scientific progress decoupled from Enlightenment confidence in the perfectibility of humanity leaves us with the dystopian imagination. Interestingly, the trajectory of the American World’s Fairs illustrates both of these points. Generally speaking, the World’s Fairs of the nineteenth and early twentieth century subsumed technology within their larger vision of social progress. By the 1930’s, the Fairs presented technology as the force upon which the realization of the utopian social vision depended. The 1939 New York Fair marked a turning point. It featured a utopian social vision powered by technological innovation. From that point forward, technological innovation increasingly became a goal in itself rather than a means toward a utopian society, and technological innovation was increasingly a consumer affair of diminishing scope. That picture was painted in rather broad strokes, but I think it will bear scrutiny. Whether the illustration ultimately holds up or not, however, I certainly think the claim stands. The twentieth century shattered our collective optimism about human nature; consequently, empowering human beings with ever more powerful technologies became the stuff of nightmares rather than dreams. Thirdly, technological innovation on a grand scale is an act of sublimation and we are too self-knowing to sublimate. Let me lead into this discussion by acknowledging that this point may be too subtle to be true, so I offer it circumspectly. According to certain schools of psychology, sublimation describes the process by which we channel or redirect certain desires, often destructive or transgressive desires, into productive action. On this view, the great works of civilization are powered by sublimation. But, to borrow a line cited by the late Phillip Reiff, “if you tell people how they can sublimate, they can’t sublimate.” In other words, sublimation is a tacit process. It is the by-product of a strong buy-in into cultural norms and ideals by which individual desire is subsumed into some larger purpose. It is the sort of dynamic, in other words, that conscious awareness hampers and that ironic-detachment, our default posture toward reality, destroys. Make of that theory what you will. The last point builds on all that I’ve laid out thus far and perhaps even ties it all together … maybe. I want to approach it by noting one segment of the wider conversation about technology where a big, positive vision for the future is nurtured: the Transhumanist movement. This should go without saying, but I’ll say it anyway just to put it beyond doubt. I don’t endorse the Transhumanist vision. By saying that it is a “positive” vision I am only saying that it is understood as a positive vision by those who adhere to it. Now, with that out of the way, here is the thing to recognize about the Transhumanist vision, its aspirations are quasi-religious in character. I mean that in at least a couple of ways. For instance, it may be understood as a reboot of Gnosticism, particularly given its disparagement of the human body and its attendant limitations. Relatedly, it often aspires to a disembodied, virtual existence that sounds a lot like the immortality of the soul espoused by Western religions. It is in this way a movement focused on technologies of the self, that highest order of innovation in Carr’s pyramid; but rather than seeking technologies that are mere accouterments of the self, they pursue technologies which work on the self to push the self along to the next evolutionary plane. Paradoxically, then, technology in the Transhumanist vision works on the self to transcend the self as it now exists. Consequently, the scope of the Transhumanist vision stems from the Transhumanist quest for transcendence. The technologies of the self that Carr had in mind were technologies centered on the existing, immanent self. Putting all of this together, then, we might say that technologies of the immanent self devolve into gadgets with ever diminishing returns–consumerist ephemera–yielding future ennui. The imagined technologies of the would-be transcendent self, however, are seemingly more impressive in their aims and inspire cultish devotion in those who hope for them. But they are still technologies of the self. That is to say, they are not animated by a vision of social scope nor by a project of political consequence. This lends the whole movement a certain troubling naiveté. Perhaps it also ultimately limits technological innovation. Grand technological projects of the sort that people like Thiel and Kelly would like to see us at least imagine are animated by a culturally diffused vision, often religious or transcendent in nature, that channels individual action away from the conscious pursuit of immediate satisfaction. The other alternative, of course, is coerced labor. Hold that thought. I want to begin drawing this over-long post to close by offering it as an overdue response to Pascal-Emmanuel Gobry’s discussion of Peter Thiel, the Church, and technological innovation. Gobry agreed with Thiel’s pessimism and lamented that the Church was not more active in driving technological innovation. He offered the great medieval cathedrals as an example of the sort of creation and innovation that the Church once inspired. I heartily endorse his estimation of the cathedrals as monumental works of astounding technical achievement, artistic splendor, and transcendent meaning. And, as Gobry notes, they were the first such monumental works not built on the back of forced labor. For projects of that scale to succeed, individuals must either be animated by ideals that drive their willing participation or they must be forced by power or circumstance. In other words, cathedrals or pyramids. Cathedrals represent innovation born of freedom and transcendent ideals. The pyramids represent innovation born of forced labor and transcendent ideals. The third alternative, of course, is the iPhone. I use the iPhone here to stand for consumer driven innovation. Innovation that is born of relative freedom (and forced labor) but absent a transcendent ideal to drive it beyond consumerist self-actualization. And that is where we are stuck, perhaps, with technological stagnation and future ennui. But here’s the observation I want to leave you with. Our focus on technological innovation as the key to the future is a symptom of the problem; it suggests strongly that we are already compromised. The cathedrals were not built by people possessed merely of the desire to innovate. Technological innovation was a means to a culturally inspired end. [See the Adams’ quote below.] Insofar as we have reversed the relationship and allowed technological innovation to be our raison d’être we may find it impossible to imagine a better future, much less bring it about. With regards to the future of society, if the answer we’re looking for is technological, then we’re not asking the right questions. You can read a follow-up piece here. N.B. The initial version of this post referred to “slave” labor with regards to the pyramids. A reader pointed out to me that the pyramids were not built by slaves but by paid craftsmen. This prompted me to do a little research. It does indeed seem to be the case that “slaves,” given what we mean by the term, were not the primary source of labor on the pyramids. However, the distinction seems to me to be a fine one. These workers appear to have been subject to various degrees of “obligatory” labor although also provided with food, shelter, and tax breaks. While not quite slave labor, it is not quite the labor of free people either. By contrast, you can read about the building of the cathedrals here. That said I’ve revised the post to omit the references to slavery. Yes, yes, and yes. But, the Naif in me is much happier with the Book of Ecclesiastes and our Amish neighbors’ Belgian draft horses who, it seems, actually enjoy being talked to, as I pass them in the pasture. The Titanic didn’t teach us much, apparently, nor , it seems, has Ozymandias. Curious to see what will replace the technology that is failing us. My wife’s aunt Dorothy was at this fair. She did portraits, some quite good, she did them quickly. She had a booth. Her name was Dorothy Dwin and she is on the internet with pictures she did. I blogged about her a while back. I’ve enjoyed your blog for a few years now; since I left academia for the mundane world, you are one of the ways I keep my mind toned and curious. I receive your blog posts via Feedly and I found the juxtaposition of your post and this one: http://cbmilstein.wordpress.com/2014/09/26/3648/ to be quite fascinating. Thanks for sharing your thoughts and explorations with us. Provacative. Might it have been worthwhile to also mention Leo Marx’s essay “Does Improved Technology Mean Progress?” and the reasons he forwards for why we seem to be mildly disillusioned about technology. Also, how would you fit something like Eric Whitacre’s TED talk “A Virtual Choir 2000 Voices Strong” into your argument? Whitacre along with transhumanism suggest that hopes of a technological sublime have yet to fade completely from whatever the current zeitgeist is.